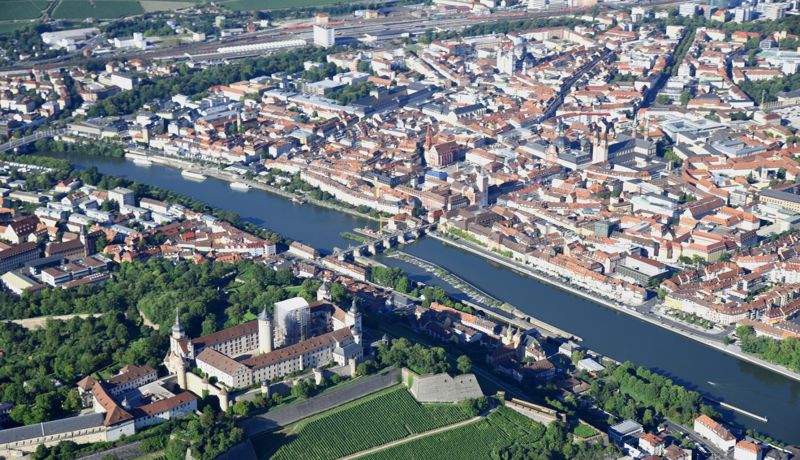 The old baroque city on the river Main is the capital of the Bavarian government district of Lower Franconia and the center of viticulture in the German wine-growing region Franconia, In the middle of the 8th century, it became a bishopric and a little later a royal palace. Already in 1402 the first university was founded. In the course of the centuries, a real monument with Old Town Hall, Marienbrücke and fortress Marienberg (in foreground), bishop's residence and universities. During the Second World War, the city and its monuments were almost completely destroyed in a single bombing night, but rebuilt after the war in ancient splendor. In the city itself or on the outskirts of it are today many vineyards with world-famous single layers as among others Abtsleite. Inner bar. Pfaffenberg and stone (with parcel stone harp). Similarly, the city of Würzburg headquarters of the three oldest German wineries, these are the historically significant Bürgerspital. Juliusspital and State Hofkeller Würzburg, In Würzburg is also the Bavarian State Institute of Horticulture and Agriculture, which is relevant in the research and breeding regarding varieties was and is active. This page was last modified at 25 April 2018 at 13:20.